SRM offers a wide variety of reference books, practical handbooks, abstracts and proceedings, indices, video, as well as subscriptions to the Rangeland Ecology & Management and Rangelands. The opinions of the authors are not the opinions of the SRM and should not imply endorsement from SRM. SRM members, the issue with Journal access that was reported earlier this month has been corrected. Please let us know if you are still not able to access a journal to which you should have online access. All you need to do to gain online access to your respective journal subscriptions is log in to the SRM Business site just as you normally would do, http://srm.allenpress.com/srm/MEMBERSHIP.aspx. Once logged in, select Journals from the menu bar. You will see a button below each journal to which you have online access which will take you directly to that journal. If you don’t see a button/link below a journal you think you should have access to, please contact us at membership@rangelands.org, or by phone at 800-627-0326 x456; direct at 785-865-9456. 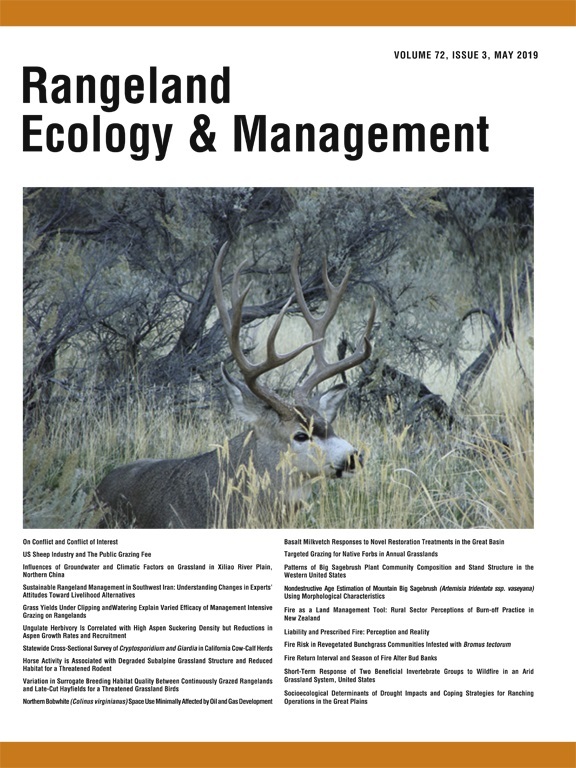 Rangeland Ecology & Management (formerly Journal of Range Management) is a publication of the Society for Range Management (SRM) and is published six times a year in January, March, May, July, September, and November. Since its premiere in 1948, the journal has provided a forum for the presentation and discussion of facts, ideas, and philosophies pertaining to the study, management, ecology, and use of rangelands and their resources. Rangeland Ecology & Management (REM) is peer-reviewed and provides international exchange of scholarly research and information among persons interested in rangelands. REM is available by subscription. SRM members receive a special discount rate! Rangelands is a full-color publication of the Society for Range Management and is published six times per year in February, April, June, August, October, and December. Each peer-reviewed issue of Rangelands features articles on the state of rangeland science (quantitative and qualitative), art, management, technology, policy, economics, education (formal and informal), society and culture; along with book reviews, highlights from the relevant scientific literature, and society news. Additionally, readers may find youth, rancher, and international forums. The journal provides readers relevant information founded in the current rangeland science and management knowledge base in a user friendly, non-technical format. Rangelands is intended for a wide-range of individuals including educators, students, rangeland owners and managers, researchers, and policy leaders. Rangelands is available by subscription. SRM members receive a special discount rate!